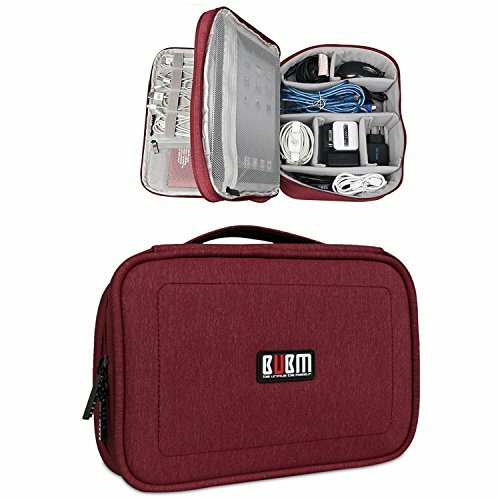 BUBM DPS-L RED Portable Travel Gadget Organizer Double Layers Electronics Accessories Bag Data Wire Storage Package (Red,Large) by BUBM at Pacs BG. MPN: DPS-L RED. Hurry! Limited time offer. Offer valid only while supplies last. This bag is durable and waterproof, good for intelligent classification. -- Waterproof MaterialMade of heavy-duty, durable and waterproof nylon. This bag is durable and waterproof, good for intelligent classification. Made of heavy-duty, durable and waterproof nylon. Double-layer, most versatile organization system designed to hold items firmly in place, Endless configurations, such as adapters, battery charger, iPad mini, USB cables, mini cameras, memory cards, hard drive etc. Simple and effective organizer to carry your electronics accessories or other stuff around. Perfect companion for your laptop bag or travel case. It also can be used as makeup organizer, jewelry organizer, medicine case, carrying case. This gadget case can be served as a travel checklist. Before you travel, just open the case and check if everything is there, preventing you from leaving things behind. √ Material: Made of heavy-duty, durable and waterproof nylon. Dimension: 11.4*9*4.7 inches; Weight: 1.1 Lb. √ Construction: The first layer has 11 elastic loops and 8 mesh pockets, the second layer has 1 large zipper pocket and 6 adjustable padded dividers. √ Excellent Protection: Durable shockproof waterproof fabric, high quality zippers. Well padded semi flexible covers and lining offer excellent protection for your Gadgets. √ Design Well: Mesh pockets and elastic loops to hold various items like cables, flash disk, USB drive, Power, Phone, Charger, Passport, Cashes, Headphone and etc. The design of the case keeps all of your electronics accessories together, and allows you easy to get them in and out of. √ Multi-function: Game card Handbag, Phone Sleeve Pouch, Purs, Card Cas ,Makeup Pen Bag, iPad Mini Protector, Pencil Box, Medicine Box, Cable Travel Organizer etc.